There is a saying saying, "ride Mercedes-Benz BMW", BMW in the handling and driving pleasure on the performance is naturally no need to say. But the luxury car also has distress, the BMW's original car multimedia system has been criticized by the owner. 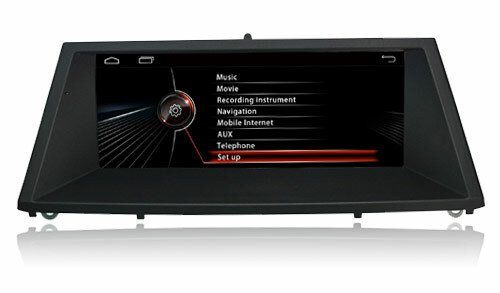 Huaying An company specifically developed for the BMW BMW large screen Andrews navigation products. The goal is to cover all the BMW cars after 1995, is fully in progress. The evaluation is applicable to the BMW 1 Series, 3 Series, X1 series dedicated navigation. After the installation experience is not just a little bit of the stars. In addition to the top of the BMW car, the other models are standard 6.5-inch display, and can only be controlled by iDrive. This is the preference for multimedia entertainment audio and video owners to enjoy, really a bit uncomfortable, and 6.5-inch display, the resolution is only 800 * 480, does not support multi-touch, is not a bit sorry luxury car's name. Hualing for the tailor-made for the 10.25-inch multi-touch high-definition screen. For the screen after the car screen resolution up to 1280 * 480, the screen delicate and clear, support 1080PMKV / FLV / AVI and other full-format video HD playback. UI style in accordance with the original car on the basis of a new design to red and black as the main colors, the main menu on the application, music, Bluetooth, navigation, DVD, the original car, radio these six commonly used features, choose more quickly and easily, Tend to be concise atmosphere. How to install the system with the original car in the end how, this may be a very concerned about the owners of a place. Xiao Bian also focused on testing this aspect. BMW iDrive system is the original test to install the system with the original car matching the most critical point, here that the perfect match is in the installation of Huaring An interface, iDrive can be flexible control of the installation system, up and down, Confirmation is very flexible and convenient. In addition the original car steering wheel keys can control all the functions of the installation system. Test the use of volume addition and subtraction, answer hang up the phone, switch mode these features are not any problems, the perfect compatibility so that owners to eliminate scruples. It is not used to the owners can switch a key car system. Navigation as the core function of the car must be the main focus of the point, but unfortunately the performance of the BMW seems to be unsatisfactory in the performance of navigation. The original car navigation through the knob operation rigid, and can not plan the route. Out of the key when the key can not find the road navigation and not to force that really angry straight stomping, it is no wonder the owner of the mobile phone navigation favor plus. Machine built Kay Rucker map, positioning accuracy, a 3D map, real map, satellite map, three modes of heart switch. After the network support to show real-time traffic, automatically avoid congestion is no longer worry about taking the wrong way. At the same time can achieve mobile Internet, dual-screen interactive fun a lot, synchronous view album, play music, video arbitrary, the whole car people enjoy car entertainment. The original car system does not achieve the touch screen, Hualing more than one touch capacitive screen to support full-screen handwriting input destination, convenient and easy. Driving on the road if it is Teng not shot to plan the line is also a wooden relationship, voice navigation liberation hands in one step. Wake up the voice after speaking the navigation address to quickly display the destination option, determine the address after the start navigation path. Xiaobian deliberately test the sensitivity of the voice, not only the rapid response rate is very high.